J.J. McCullough’s Complete Guide to Canada launched today. While J.J. did all of the real work researching and writing all the content, I proofread and copy edited every single word (more than 90,000 of them! ), as well as fact-checked a lot of names, dates and other data. 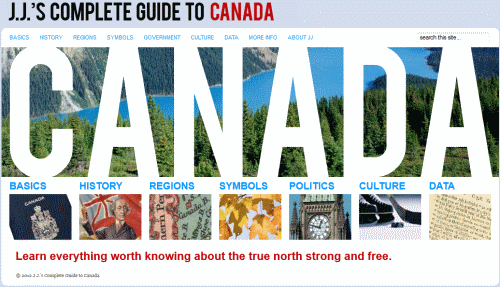 It’s a great resource and I highly recommend it to anyone who wants to learn more about Canada. In reading every page of J.J.’s exhaustively informative site, I learned more about Canada than I’d ever known before. In fact, I’d say that I probably have a better grasp of Canada’s political system than America’s at this point. The favorite thing I learned from the site is that I was actually born (in Canada, of course) on a Canadian federal election day, right in the middle of John Turner‘s glorious tenure. The very election day that swept the Liberals from power in a massive landslide, and sentenced Turner’s ministership to be the second-shortest in Canadian history.